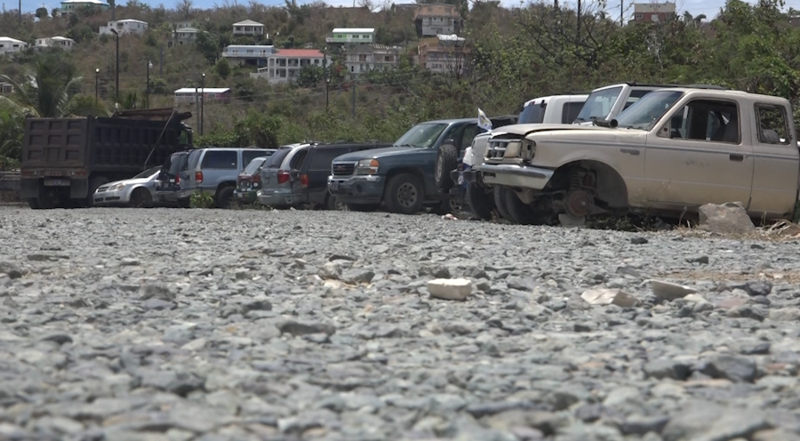 They’ve been piling up for years, dozens upon dozens of cars near Cruz Bay in St. John. Now local groups and local government are stepping in to clear out the old vehicles. The last time we were here we counted about 40 abandoned vehicles in this lot and its’ become an eyesore for both local residents and people coming to visit the island. This is the first stop as you come off the car barge and it’s just steps away from the popular Cruz Bay area with many bars and restaurants. So the government is stepping in to try and remove some of the vehicles. They removed about 10 shells of cars from the parking lot. We caught up with the St. John Administrator Shikima Jones to find out what their plan is going forward. In a set back to the plan, of those 10 shells that were removed, new left behind vehicles have already come in to replace them. So as Jones said it is about the car owner being responsible and following the proper procedure to remove their car off island. Jones added that she hopes to have parking spaces available again without any abandoned vehicles in the lot by the summer. We’ll keep following this story for any updates and keep bringing you the latest as your parking lot becomes open again. This was done in collaboration with the VI PORT AUTHORITY, Love City Strong and local government.